I've been playing around with using tabs. The problem I am having is when I populate the different tabs the tab I am current looking at does not refresh and look like parts of the window is missing. If I click on one of the other tabs and come back it's fine. Also, when I change the tab name it blanks that tab out and again if I click on a different tab and come back it looks fine. So I think it's a refresh problem. I've got the exact same problem. I got a GUI with 4 tabs. Within that, I got a main tab that is entirely filled with an edit control. Furthermore, I got 2 tabs that each have 2 elements: 1st element is a listview and the other is an embedded IE control. They are split 50/50 in the tab, regarding the space they use. 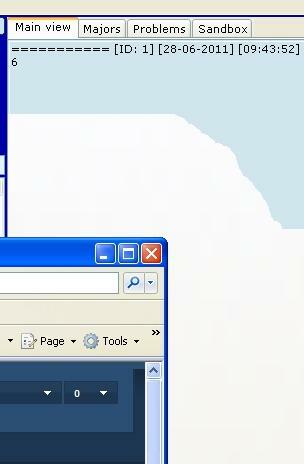 The listview shows messages which are displayed in the IE control after selecting them. This describes the situation and everything works fine, yet the problem happens when I open any other window and it happens to be painted in front of my main GUI screen. What happens then is that the spot where the tabcontrol is, gets 'erased'. If I minimize my GUI and maximize it again, the window is repainted again but if I click my GUI, it is not. If I switch from tab to tab, it gets repainted too. I have added a screenshot of the situation. Is there any way to avoid the erasing of my main GUI 'paint' when moving other windows in front of it? If I don't use tabs, this doesn't happen so I assume it has something to do with tabs in general.